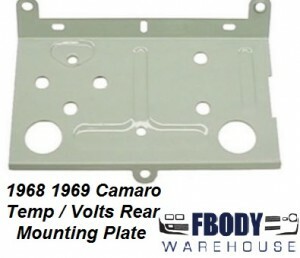 This is a new replacement center console mounted temp / volts gauge rear mounting plate for the console mounted gauge pod. For use on 1968 1969 Camaro. Console gauge mounting plate fits into base to position amp and temp gauges. Accurate reproduction.